Outfielder Andy Gilbert's time in the majors was very brief, bracketing the World War II years. He played in six games for the Boston Red Sox in September 1942 and two games in the first few weeks of the 1946 season. In between, he served in the Army Air Corps for three full years. During his brief tenure with the team, he recorded one base hit, one run batted in, one run scored, and handled all six outfield chances without an error. Gilbert was of Slovak heritage. The family name was Gibart originally, and both parents came from what was then called Austria, father Mike arriving in America around 1897 and mother Meri Dirga Gibart around 1900. The first five children in the family were all boys, followed by two girls. Andrew Gilbert was the fifth of seven children in the family at the time of the 1920 United States census. He was born on July 18, 1914, in Bradenville, Pennsylvania, about 40 miles east of Pittsburgh and within a mile of Latrobe. Mike Gilbert was a coke drawer in a coal works. With the demise of the Austro-Hungarian empire, the 1930 census gave the Gilbert parents' country of origin as Czechoslovakia. They seem to both have had their roots in Jastreb. He wrote that he had started in professional baseball, "signed by Fred Hunter – Boston scout while playing Semi-pro in Jenkins, Kentucky. 1937. "2 Frederick "Newt" Hunter had been a first-baseman with the Pirates in 1911, the highpoint in a career which began in 1903 and ran through managing in 1925. Not only was Gilbert able to return to baseball in 1938, but he played in 118 games, for Danville in the Class-D Bi-State League, hitting 18 homers with a .335 batting average. He more or less matched the mark in 1939, again hitting 18 home runs, with a .324 average in 136 games for the Clarksdale Red Sox in the Class-C Cotton States League. Gilbert stood an even six feet tall and is listed at 203 pounds. A Boston Red Sox press release some years later, in March 1946, said he was "built like a fireplug." Class-B ball proved more of a challenge, when he played for the 1940 Rocky Mount Red Sox (Piedmont League) – with a .254 average and 14 homers in 107 games. He'd missed five weeks during the course of the season due to back surgery, apparently caused by tripping over a sprinkler in the outfield.7 He suffered a broken wrist in his minor-league years at some point, too.8 He played for Scranton for most of 1941, hitting .280 in the Class-A Eastern League. On July 29, the fourth anniversary of his broken back, he suffered a dislocated right shoulder. His teammates gave him the nickname "Humpty Dumpty. "9 At the very end of the season, he appeared in five games for the Louisville Colonels. Gilbert married Helen Milvak in January 1942. That year he played 153 games with Louisville, both at first base and in the outfield, batting .298 and driving in 83 runs. His 19 triples led the league. After the American Association season was over, Gilbert was brought up to the Boston Red Sox. It wasn't the Navy. He served in the Army, inducted in January 1943 at Fort Meade and stationed at Jefferson Barracks near St. Louis and then – in the Army Air Corps – at Geiger Field, Spokane. He served in the Air Corps until his January 28, 1946, discharge at Patterson Field. The Red Sox played him some at third base in the springtime, and in right field. He made the team out of spring training, and when U. S. President Harry Truman threw out the ceremonial first pitch in Washington to kick off the first season of postwar baseball, it was Andy Gilbert who caught the ball "after a wild scramble." He had the president sign the ball, and then said to Truman, "Thanks a lot, pal. "12 It was the last highlight of his time in the big leagues. 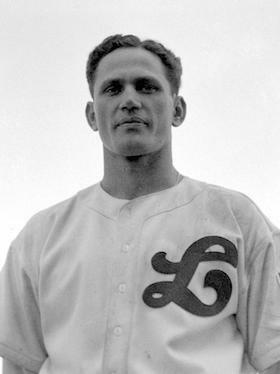 The 1946 Red Sox proved to be a juggernaut, boasting a 20-3 record as of May 9, the day Gilbert was sent down to Louisville. Gilbert had appeared in two games for the 1946 pennant-winners, as a pinch-hitter who played late-inning center field on April 24 and as a pinch-runner in the May 7 game against the St. Louis Browns. He couldn't have known it at the time, but they were his last two games in the major leagues. His record today shows him with a career .083, with the one base hit and one RBI from 1942. He managed Giants teams in Muskogee, Danville, Johnstown, and Muskogee again through 1957. The last time he appeared in more than one game as a player was 1955 in Danville. From that time on, Gilbert managed. He had a lengthy stint from 1958 through 1965 managing the Springfield, Massachusetts, Giants, with the exception of 1963, when he was manager for the Tacoma Giants in the Pacific Coast League. Springfield had won the pennant in 1959 and 1961; Gilbert was "manager of the year" in 1961. Then it was Waterbury for 1966 and 1967, and Amarillo for 1968 through 1971, with first-place finishes in '69 and '71. In 1972, Gilbert returned to the major leagues as a coach for the San Francisco Giants, the first two years in the bullpen and the second two years as bench coach. Back to minor-league work with Fresno, and then two-year stints in succession with Waterbury again, Shreveport, and Savannah. After the 1982 campaign with Savannah, the 67-year-old Gilbert left managing. He died in the emergency room of Davis, California's Sutter-Davis Hospital, on August 29, 1992. The cause of death was a massive pulmonary thrombosis and acute respiratory failure. He had been suffering from Alzheimer's disease. Gilbert was predeceased by his wife, who had died six months earlier, and two brothers. He was survived by daughter Joanne Gilbert Owens, two brothers, three sisters, and two grandchildren. He is buried at St. Vincent Cemetery, Latrobe, Pennsylvania. In addition to the sources noted in this biography, the author also accessed Gilbert's player file and player questionnaire from the National Baseball Hall of Fame, the Encyclopedia of Minor League Baseball, Retrosheet.org, Baseball-Reference.com, Rod Nelson of SABR's Scouts Committee, Bill Lee's The Baseball Necrology, and the SABR Minor Leagues Database, accessed online at Baseball-Reference.com. 1 "Power Outstanding Trait of Terriers in Opening Workout," The Repository (Canton, Ohio), April 13, 1937: 22. 2 Handwritten note in Gilbert's player file at the National Baseball Hall of Fame. 3 Jim Sims, "O'Malley and Gilbert Like Peas in a Pod," unidentified newspaper clipping dated June 12, 1971. Clipping is in Gilbert's player file. 5 Handwritten note, Andy Gilbert player file. 6 "Keeping Up with the Terriers," The Repository (Canton, Ohio), August 22, 1937: 17. 7 Handwritten note, Gilbert player file. The mention of the sprinkler was in Ed Rumill, "Rookie Gilbert Has Chance of Staying with Sox Awhile," Christian Science Monitor, March 17, 1946: 12. 8 Burt Whitman, Boston Herald, January 20, 1943: 19. 9 Charleston News and Courier, June 10, 1942: 6. 10 Fred Barry, "Sox Take Final Over Yanks, 7-6," Boston Globe, September 28, 1942: 5. 11 Bill Cunningham, "Minor Leagues In A Quandary," Boston Herald, September 17, 1942: 20. 12 George Dixon, King Features, "Infielder to Mr. Truman – Thanks, Pal," Omaha World-Herald, April 19, 1946: 16.